The SLCA Board heard the feedback at our annual meeting that members would like to hear updates more frequently than once a year. We discussed the Bennett’s Run diversion dam at the annual meeting. Our engineer and the DEP both conveyed a sense of urgency about addressing a permanent fix to the existing diversion dam. DEP told us to either fix it or remove it. The Bennett’s Run diversion dam is important to the health of our lake. It is an important water source, keeping water running through our lake most of the year. Years when the diversion dam was in poor repair were marked by higher water temperatures and the “green slime” that drifted on the surface of the lake due to stagnating water. For most of the last decade we have been “fixing” the crumbling concrete diversion dam with sandbags and pond liner! The diversion dam repair process would be a good trial run for the board on working with DEP on engineering, permitting, and oversight of a dam repair. We contracted for a survey of the SLCA property and rights of way to the diversion dam. Additionally we had the surveyor perform elevation measurements at the same time to facilitate the engineering of the final dam repair. Upon receipt of the survey, the SLCA’s engineer advised that he would begin the design and permitting process, and realistically we are looking at the spring/summer of 2017 for the dam repair. The SLCA owns 2 dams and a spillway which we are responsible to maintain. We are also responsible to police the feeder streams and periodically remove fallen trees, dumped tires and other garbage, and animal dams. We have had VERY lightly attended work parties for the last several years. 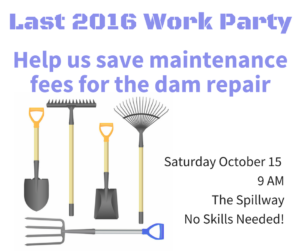 A SLCA work party is intended to have the community participate in unskilled maintenance such as mowing, weed wacking, and cleaning feeder streams. Regretfully, the members who show up are primarily board members and a handful of regulars – these do not have widespread community support. The volunteers have not only been able to keep up with routine maintenance to our engineer’s and DEP’s satisfaction, they have also performed animal burrow remediation as called for in our 2015 Annual Inspection. The board will be looking into hiring professional maintenance services in the coming year. While this expense will delay the inevitable repair of our earthen dam and prolong the DEP ordered moratorium on silt removal, your board is not getting any younger and we cannot keep doing this alone. 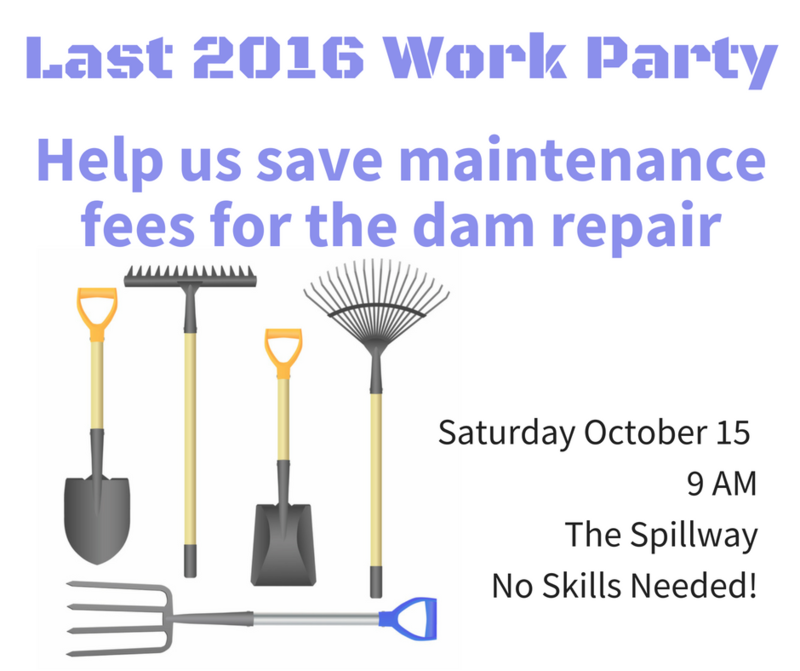 Our last work party of 2016 will be Saturday October 15th. Watch Facebook for details. We will host our annual SLCA Fall Community Social on Saturday October 22 at 3 PM at the end of Cardinal Lane near the cove. This event is “covered dish” and BYOB. Board members will take care of disposable products. We have really enjoyed these the last few years!